DALLAS – Cisco’s introduced a new Artificial Intelligence-based voice assistant called Spark Assistant that will act as a virtual assistant inside an organization. Cisco made it clear that Spark Assistant is not a consumer grade voice assistant such as Siri, Cortana, Alexa and Google Assistant, but an enterprise-class tool that can act as a meeting moderator and be a virtual member of the team. Rowan Trollope, senior vice president and GM of Applications Group for Cisco, said Spark Assistant uses conversational AI and the goal is to have people become more comfortable talking to devices. Cisco acquired MindMeld, whose founder Tim Tuttle authored a book on conversational AI. Trollope said that Spark Assistant is a new technology with five levels of AI similar to self-driving cars. “The goal is to make Spark Assistant a virtual team member that can help you get work done and be a part of your meeting. It can chat, track things and give meeting members reminders. This is a system that might recommend a person who should be included in the meeting because that person can add value to the team. Computers do this well, while humans consistently don’t,” the Canadian-born executive said. Cisco Spark Assistant will be on the Spark platform and will be named Spark. Cisco did have the name Monica, but according to a source Monica was a name used during experiments for the voice assistant tool. Going forward the voice assistant will be named Spark. 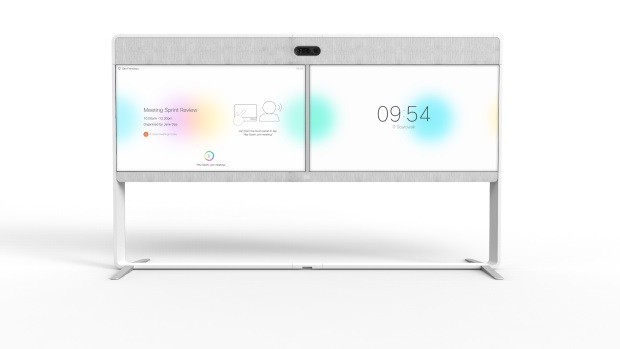 The Spark Assistant will be first on the Cisco Spark Room Series portfolio headlined by the new Cisco Spark Room 70. The system is being powered by the Nvidia Jetson technology that has been optimized for deep machine learning. Tuttle said there are 50 billion voice queries done every single month on Alexa, Cortana, Siri and Google Assistant, but in 2020 it is expected that more than half of the searches being done will be done by voice with solutions such as Google Home and speech recognition in cars. “This can happen in the workplace as this is a conversational assistant for the workplace,” Tuttle said. This is just phase one of Spark Assistant. Tuttle added that Spark Assistant will start with a few basic skills and manage common tasks, but over time Cisco wants it to grow into a useful assistant that may have the ability to take over the entire process. “With Alexa at my home it was shocking to see how quickly it can recognize you and be responsive. We ended up using our smartphones less especially to play music,” Tuttle said. The Cisco Spark Room 70, for example, includes 70-inch 4K screens in either single or dual mode with quad 4K cameras built with intelligent framing. Spark Assistant is free with the Spark Flex license and associated hardware. This can be situated in a traditional conference room or in the cloud. Cisco sees Spark Assistant helping any size operation and this includes the SMB. Trollope said Spark Assistant can be run in a two-person company up to a company with 200,000 people. Trollope went on to say that Spark Assistant is different than voice bots such as Slack. Internally Cisco has 15,000 voice bots throughout the Spark platform. For example, they have one for placing and tracking orders. “What we are trying to do with Spark Assistant is to create a virtual team member who is human-like. It has ears and eyes and can access the camera and knows how to recognize faces. It will live in the cloud so it can be on your desktop and in your smartphone,” he said. The first language will be English, but Trollope said new languages will be coming in 2018 but it will be based on customer feedback. Can Spark Assistant do more in Phase Two? Well, Trollope stopped short of saying Spark Assistant could do a person’s spreadsheet or write a document. But it can do call to actions and follow up. Spark Assistant can tell a teammate to get their report done as a follow up. “When we looked at this we thought we needed to re-imaging what the business is. We asked ourselves…gosh are we now an audio-visual technology company? Or are we a business that helps people get work done. I think that is a bigger job. Meetings are way of getting work done. The best technology in the world will not stop crappy meetings because people can get off track and have no follow up. People are people and they are inconsistent and they can get distracted, but the computer does not get distracted. It never forgets things and can make teams more effective,” he said.